Event #30: $1,000 No-Limit Hold'em had crowned its champion just moments ago. Chris Dombrowski battled through a field of 2,108 players over three days to earn his way to the $346,332 first-place prize and the coveted gold bracelet. The tournament lost several notable players along the way including: John Phan (199th), Andrey Zaichenko (163rd), Justin Young (156th), Andrew Lichtenberger (133rd), Jon Aguiar (112th), Nam Le (102nd), Todd Terry (98th), Kevin MacPhee (42nd), Randy Lew (39th), John Racener (36th), Antoine Saout (34th) and Eddy Sabat (32nd). Of the 13 returning players, Dombrowski started the day third in chips. The tournament would see the eliminations of Thomas Miller (13th), Thien Le (12th) and Ryan Riess (11th) within the first 30-minutes of play to make the unofficial final table. Just another 30 minutes later, Ben Greenberg would hit the rail in tenth place to secure Dombrowski his first WSOP final table. 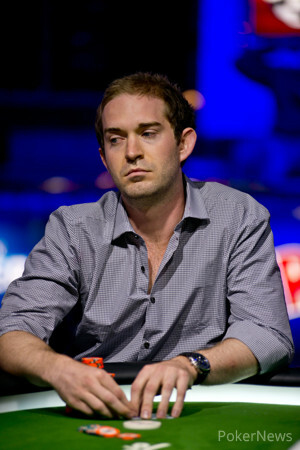 Jonathan Thompson was the first elimination of the final table and it occured just ten hands into play. He was followed by Mike Pickett (8th) and Matt Seer (7th). The tournament played six-handed for over an hour before the elimination of Chris Bolek and it was another two hours before Carter Myers would be eliminated in fifth place. Just a few hands later brought the elimination of day two chipleader, Dimitar Yosifov. Three-handed play saw chips moving back and forth with Dombrowski trying to take control but Mathew Moore and Jesse McEuen were playing back and finding hands. It took McEuen and Dombrowski with all the money in the middle each holding ace-high before another elimination would occur. Dombrowski made a flush on the river to send McEuen to the rail in thrid place and set up a heads up match with Moore. The 2 1/2 hour heads up match saw chips going back and forth but Dombrowski never gave up the lead. In the end, Moore made a move with but Dombrowski was ahead with his . The board was kind to Dombrowski and Moore was eliminated in 2nd place taking home $215,578 for his efforts. While this may be Dombrowski's first WSOP final table, it is his 16th WSOP cash and he has found success both online and in live tournament play, even laying claim to a WSOP circuit ring. Find out a bit more about Dombrowski in his winner's interview with Kristy Arnett. Now that another gold bracelet has been awarded, our coverage of Event #30: $1,000 No-Limit Hold'em is complete. 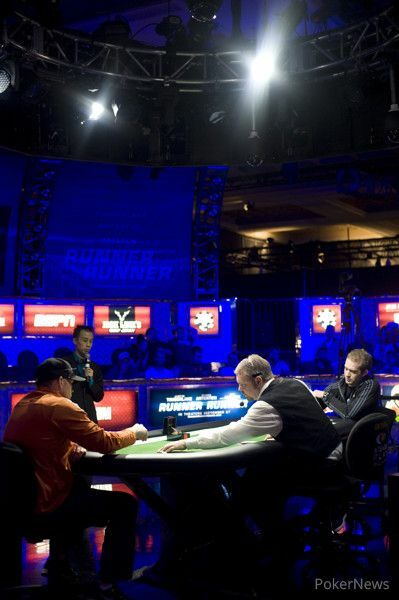 Stay with PokerNews.com for all the latest coverage coming to you from the 44th Annual World Series of Poker. 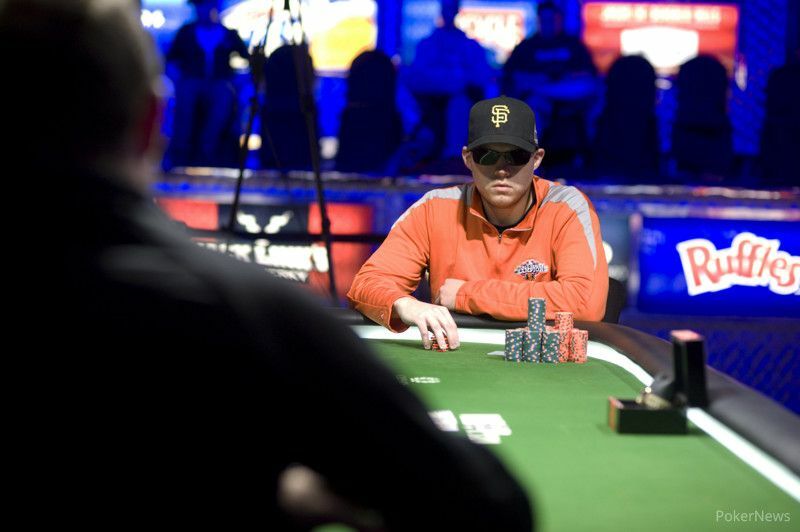 Chris Dombrowski raised to 200,000 and Mathew Moore moved all in for roughly 1,600,000. Dombrowski called and Moore realized he needed some help. The flop wasn't kind to Moore and the turn and river secured his fate. Moore left the tournament as the 2nd-place finisher and took with him $215,578. Not a bad payday for his first WSOP cash. From the button, Chris Dombrowski raised to 200,000 and Mathew Moore made the call to see a flop fall. Moore tapped the table and Dombrowski tossed in two 100,000-chips to force a fold from Moore. Mathew Moore squeezed a peek at his hole cards and then made it 200,000 from the button and picked up the big blind and antes. Chris Dombrowski raised the button to 200,000 only to fold when Mathew Moore moved all in. 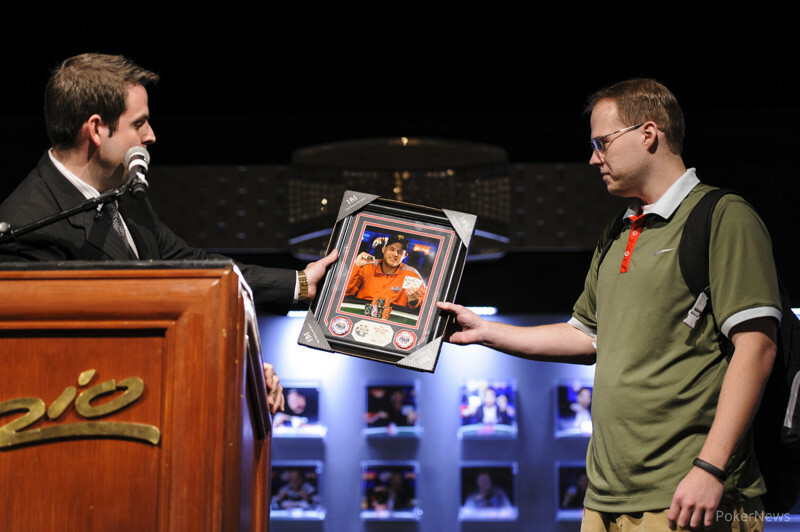 Mathew Moore raised his button to 200,000 and Chris Dombrowski three-bet to 480,000. Moore rechecked his hole cards and returned to shuffling chips before eventually folding his hand. Mathew Moore receives a walk in the big blind. Mathew Moore popped it up to 200,000 and Chris Dombrowski moved all in to force a fold from Moore. Here are the updated chip counts as we return from break. Moore raised to 160,000 and showed after Dombrowski folded to the raise. Dombrowski raised to 160,000 and Moore made the call. Moore checked the f]op and Dombrowski bet 160,000. Moore released his hand and Dombrowski took the pot. Moore raised to 160,000 and Dombrowski reraised to 380,000 causing Moore to release his hand. Dombrowski raised to 160,000 and Moore reraised to 390,000. Dombrowski 4-bet to 760,000 and Moore let it go. Moore raised to 160,000 and Dombrowski folded. Dombrowski gave Moore a walk. Moore raised to 160,000 and Dombrowski made the call. Both players checked the flop and the turn. Dombrowski bet 220,000 on the river and Moore called. Dombrowski showed for two pair and the pot. With the conclusion of that hand, the players are on a 20-minute break. Chris Dombrowski raised to 160,000 and Mathew Moore made the call to see a flop fall with both players checking. 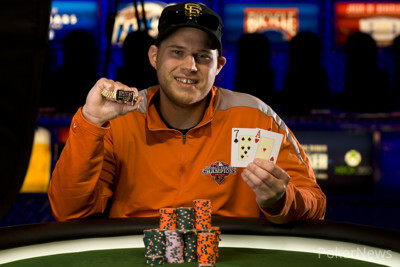 The turn landed the and Moore led for 175,000 with Dombrowski making the call as the completed the board on the river. Moore took his time before sliding out a 485,000-chip bet which Dombrowski called. Moore tabled his for the nut flush and scooped the pot to edge closer to Dombrowski. From the button Mathew Moore raised to 160,000 and won the big blind and antes. Chris Dombrowski raised to 160,000 and Mathew Moore made the call as the dealer spread a flop with Moore checking. Dombrowski bet out 160,000 and Moore made the call as the rolled off on the turn. Moore checked once again as Dombrowski pushed out a bet of 365,000 to prompt a fold from Moore as he uttered, "good bet!" Mathew Moore bumped it up to 160,000 and Chris Dombrowskifolded. Mathew Moore received a walk in the big blind. Chris Dombrowski began the 50th heads up hand with a raise to 160,000 and Mathew Moore released his hand. Moore raised to 160,000 and Dombrowski made the call. Dombrowski checked and Moore bet 175,000 on the flop. Dombrowski raised to 485,000 and Moore gave up. Dombrowski raised to 160,000 and Moore folded. Dombrowski raised to 160,000 and Moore made the call. Moore checked the flop and Dombrowski bet 160,000 with Moore coming along. Both players check the turn. Moore checked the river and Dombrowski checked behind. Moore showed for two pair and the pot. Moore raised 160,000 and Dombrowski made the call. Dombrowski check folded the flop to Moore's bet of 175,000. Final Day of Event 30; Dimitar Yosifov Leads!